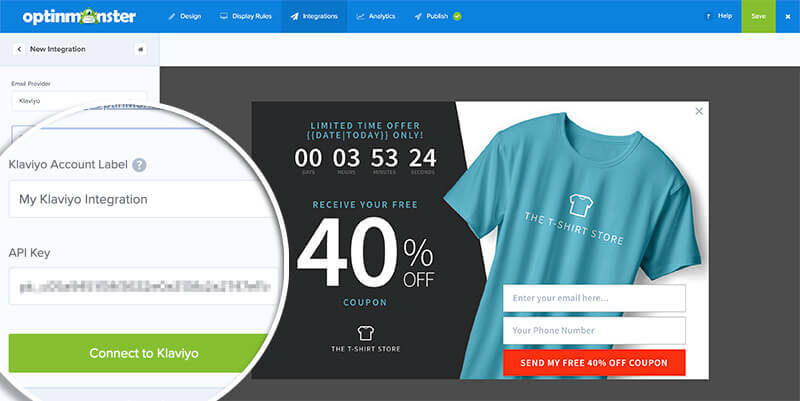 OptinMonster offers seamless integration with the Klaviyo email marketing service. Connecting OptinMonster to your Klaviyo email list is very easy. 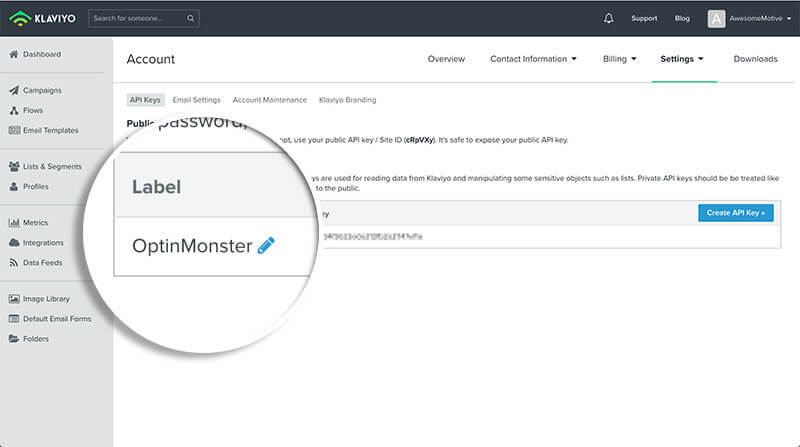 Follow our step by step guide on how to connect OptinMonster with your Klaviyo account. How do I configure single or double opt-in? Is it possible for me to add a phone field to my campaign? How can I send the referral URL with the lead so I know on what page the visitor signed up? REQUIREMENT: Our native Klaviyo integration requires a Plus subscription. However, you can still use our Custom HTML integration with a lower subscription. 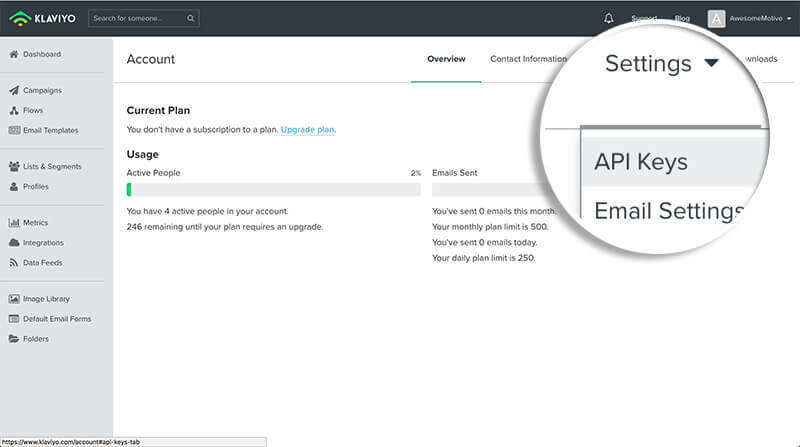 If you’re uncertain how to add your integration, you can follow our guide for connecting to Email Service Providers and CRMs. Next, select Klaviyo from the Email Provider drop-down. To obtain your Klaviyo API credentials, log into your Klaviyo dashboard and navigate to your Account page from the dropdown menu next to your avatar and name. 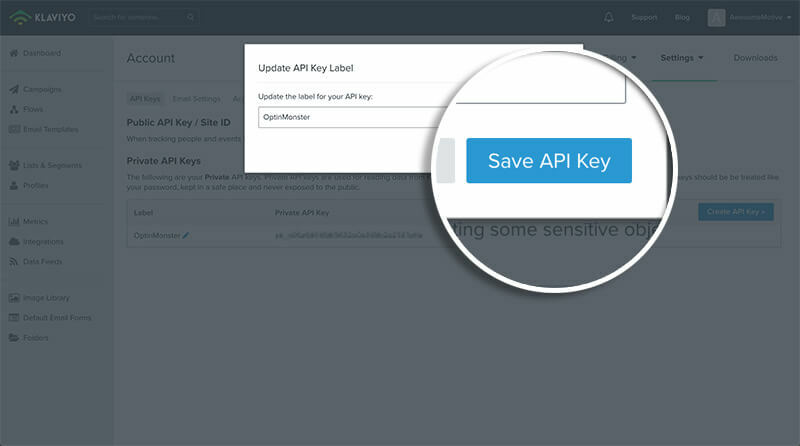 On the Account page, you will need to select the API Keys link under the Settings drop-down menu. 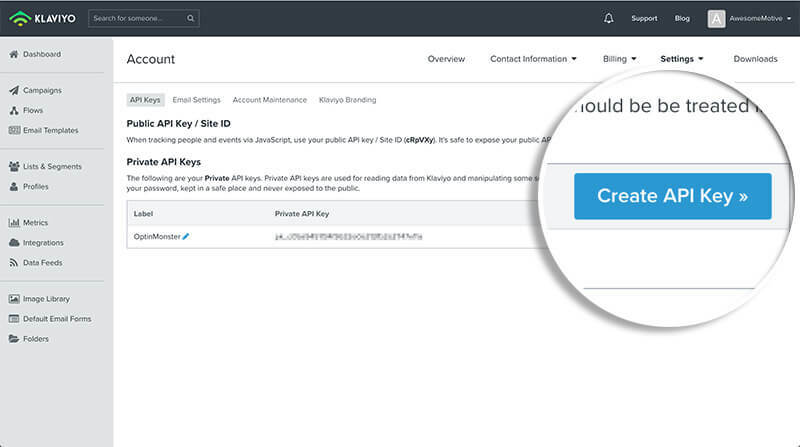 If you haven’t already created a specific API Key you wish to use, select the Create API Key button. A popup will appear for you to enter the API Key label. When you’re finished, select the Save API Key button. 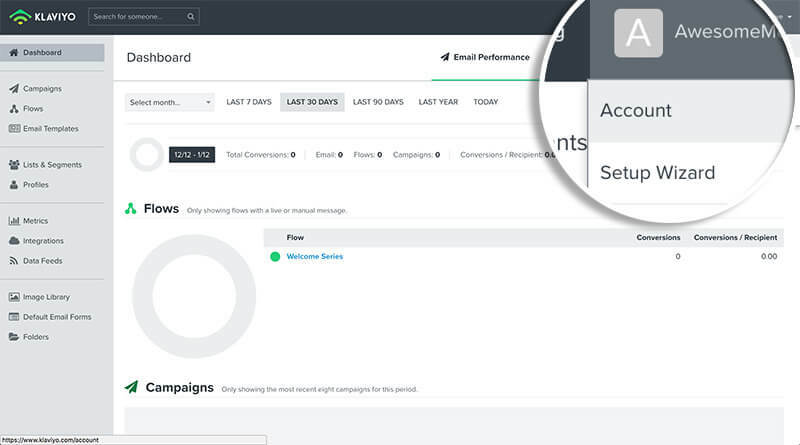 Now that you have an API Key ready, copy it and return to the Campaign Builder. In the Campaign Builder, paste your API Key into the corresponding field. Don’t forget to add a unique label for easy identification! Then, select the Connect to Klaviyo button. OptinMonster will now connect to your Klaviyo account and fetch your email lists. Select an email list you want users to subscribe to. That’s all, you have successfully connected OptinMonster to your Klaviyo account! Ready to make your campaigns live? See our guide on how to embed your campaigns to your website! Q: How do I configure single or double opt-in? A: See our guide on single vs. double opt-in for Klaviyo. Q: Is it possible for me to add a phone field to my campaign? A: Yes! You can add a phone field. Check out how to capture phone numbers with OptinMonster here. Q: How can I send the referral URL with the lead so I know on what page the visitor signed up? A: This happens automatically. In Klaviyo, this will be in a custom property called referrer.